In 1946 when Walter Croll opened his small upholstery and bedding workshop in the Millbrook area of Southampton, majestic ships from such famous lines as Cunard, P & O and Union Castle daily sailed into Southampton Water. The superb interiors of these vessels, which had made Britain’s passenger fleet a byword for luxury and elegance, demanded the highest standard of workmanship. The craftsmanship of Walter Croll’s workshop soon began to win it a growing number of orders from discerning customers, and when the Union Castle Line awarded Millbrook a contract to refurnish and carpet their entire fleet, the success of the young Company was assured. Year by year the Company has continued to grow and prosper, using the skills employed on the luxury liners to create an ever-growing range of luxurious, high-quality furniture and achieving an enviable reputation – both in finest retail stores and among a widening circle of discerning contract customers. Today, Millbrook craftsmanship in both bedding and upholstery is acknowledged as being of the very highest order and examples of their skill can be seen and admired in both Houses of Parliament, in Embassies around the world and in elegant private homes throughout Britain, Europe and the United States. In addition, millions of people have unknowingly seen Millbrook craftsmanship on their television on programmes produced by TVS such as the “Ruth Rendell” mysteries. Amongst their many diverse skills Millbrook have restored antiques on display in such diverse places as Sterling Castle and Osborne House, created an artificial “Aladdin’s Cave” for a Middle Eastern Sheikh and more recently completed major work in Downing Street. Closely examine any piece of Millbrook Bedding and you will immediately see that throughout the years both material and workmanship have remained as high as ever. Our mattresses and divans are meticulously hand-crafted to enhance their individual character. The finest materials are used to ensure the greatest comfort and traditional hand-finishing helps extend the life of the bed. Overall, a “rightness” of design, avoiding both the fussy, or whimsically fashionable, and yet offering the highest standards in visual appeal makes each Millbrook bed a classic to treasure and enjoy for many years. Millbrook are very much a family firm. Many of the skilled mattress and divan makers and seamstresses have followed their parents or grandparents into the Company. To everyone, the excellence and high reputation of Millbrook is a matter of quiet personal pride and it is perhaps this more than any other factor that results in the supreme quality and finish of each piece of Millbrook furniture. 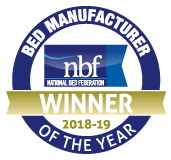 Of course, Millbrook Beds Ltd was one of the first pocket sprung bed companies to achieve B.S. 5750.